Enugu – Igbo Leaders of Thought including governors, members of the National Assembly, NASS, the leadership of Ohanaeze Ndigbo, traditional rulers and church leaders met at Enugu Sunday night and pledged their support for a restructured but united Nigeria where there would be justice, equity and fairness. 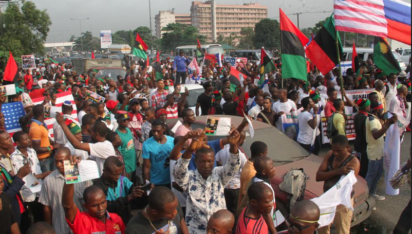 The Movement for the Actualization of the Sovereign State of Biafra, MASSOB, has however, rejected the opposition of the Igbo leaders to the splitting of the country, saying that the leaders were helping the Nigerian government to delay the imminent disintegration of the country. The leader of MASSOB, Comrade Uchenna Madu, made this known in a statement in Enugu, Sunday, stressing that the leaders had always avoided the issues that that had fuelled the Biafra agitation, whenever they had the opportunity to sit with the presidency officials. However, those who attended the Igbo leaders’ meeting included the President General of Ohanaeze Ndigbo, Chief Nnia Nwodo, all the five governors of South East geopolitical zone led by Chief Dave Umahi of Ebonyi State, Hon Ifeanyi Ugwanyi (Enugu), Chief Willie Obiano (Anambra); Owelle Rochas Okorocha (Imo), Dr Okezie Ikpeazu (Abia), members of the National Assembly as well as the former Chief of General Staff, CGS, during the General Ibrahim Babangida’s administration, Commodore Ebitu Ukiwe, retd. They also included the Deputy Senate President, Ike Ekweremadu, former Senate President, Ken Nnamani, Chairman of South East Caucus in the National Assembly, Senator Enyinnaya Abaribe, former Governor of the Central Bank, CBN, Prof Chukwuma Soludo, Senator Sam Egwu, the Catholic Bishop of Nsukka, Prof Godfrey Onah, the Archbishop of Enugu Diocese of the Anglican Communion, Dr Emmanuel Chukwuma, the Obi of Onitsha, Igwe Nnaemeka Achebe, the National Chairman of the United People’s Party, UPP, Chief Chekwas Okorie, Prof Barth Nnaji, Mrs. Josephine Aneni, and Senator Gill Nnaji among others. In a communique read by the Chairman of the South East Governors’ Forum, Chief Dave Umahi, after the meeting which lasted till the early hours of Sunday, the Igbo leaders declared their full support for a united Nigeria, where peace, justice, love and fairness reigned supreme. The seven-point communique read, “This a communique arising from a meeting of South East governors, members of National Assembly, Ohanaeze Ndigbo, our traditional fathers, spiritual fathers and some selected Igbo leaders of Thought on the state of the Nation. It was held today, the 1st day of July, 2017 at Nike Lake Resort Hotel, Enugu. “We deliberated on a number of issues and we arrived at the followings: That Ndigbo are in full support of a united Nigeria, where peace, love, fairness, justice, equity and equality of opportunities are paramount, regardless of creed, ethnicity, gender or political affiliation. “We condemn all hate speeches and misconducts from any segments of the country. That Igbo leaders lend their full support to the restructuring of the federal republic of Nigeria on the platform of fairness and equity. We therefore call on the federal government and all Nigerian leaders to commence a process of dialogue among Nigerians on the modalities of achieving this pressing question within a reasonable time frame. “That Ndigbo support the report of the National Conference of 2014 and we urge the federal government to set up structures that will enable the implementation of the same within a reasonable time. “That the South East Governors, members of the National Assembly, leadership from the south east and the leadership of Ohanaeze Ndigbo shall henceforth constitute the official organs that shall speak on behalf of Ndigbo. “That south east leaders in consultation with other parts of the country, will set up a committee to engage the Federal Government on all issues that concern Ndigbo. The statement by MASSOB signed by its Leader, Comrade Madu, and entitled “MASSOB blasts Igbo Religious, Traditional, Political & Opinion leaders for their nonchalant and insensitive attitude towards the current consciousness and realities of Biafra,” read, “Why is it that whenever these self-acclaimed Igbo leaders meet among themselves or with the Nigeria presidency, they always side-lined the primary and principal reasons and cause of Biafra agitation? “Yesterday’s meeting of Igbo leaders in Enugu is tactically helping Nigeria government in postponing the explosion of the inevitable and unstoppable ticking time bomb which Nigeria comfortably sat on. “Their decisions are not the true minds and positions of the people of Biafra. We want Biafra and nothing but Biafra. Nigeria must disintegrate, her faulty foundation has broken beyond repair. “The non-violence struggle for Biafra actualisation and restoration is a reactionary revolution against the continued neglect, political injustices / imbalance of federal structures against Ndigbo by successive governments of Nigeria since 1970. We are in this self-determination struggle because of political, economic, academic, religious slavery which the government of Nigeria had subjected Ndigbo into in Nigeria. “MASSOB and other genuine pro Biafra groups are in the Biafra struggle because of the grand plan to Islamize the people of Biafra with subtle and harsh economic policies against Biafrans. “We are in the struggle to counter and correct the evil plot to enslave our children and their future,. We are in the struggle re -establish and revive the tenacity, economic independence and industrial nature of Ndigbo which astonished the world in 1950–70’s. “Truly, we are in the struggle to restore the dignity, culture and integrity of Ndigbo. In this struggle, numerous sacrifices have been made. Supreme prices are being paid; we have been tortured, mesmerised, killed, incarcerated for the sake of Biafra and glory of Ndigbo yet we are neglected, abused and abandoned by people who benefit from our exploits. “MASSOB and other agitators are the political masquerades and glory of Ndigbo as Book Haram is to Hausa Fulani; OPC to Oduduwa and Niger Delta militants to South -South. MASSOB still has high respect to few Igbo leaders who unflinchingly and boldly defend the interests and course of Biafra agitators.